Who needs it and who can help? Not all employers are able to provide comprehensive end of journey Travel plan facilities. Therefore, there is a very real need for them to be situated on council land and in the urban realm. Our belief is that by applying a collaborative approach; working with Councils, Business Improvement Districts’, Transport authorities, Charities and others, a network of hubs could be built. They would be sustainable, accessible and affordable. Making cycling, running, scooting and skating to work a real travel option for everyone who wanted to; regardless of income, or the organisation they work for. As we all know commuting habits are changing rapidly, nationally. More and more people are combining the necessary commute with a workout. The trend is rising fast. The average one-way UK cycle commute (uploaded on to Strava) is now 17km or 10.5 miles. The average time taken is 43mins. Government and Transport authorities’ investment in infrastructure has given added impetus to this growth. Over the same period there has been a huge rise in run commuting. This is not surprising given the Government’s concern over the health trends of the nation, and our more health aware and environmentally conscious society. This is leading to a far greater demand for secure bike parking, showers and lockers in the workplace than ever before. With demand growing daily it has created a real headache for employers. They have encouraged but now need to cater for this growing movement of active commuters. Research has found; there is a distinct lack of facilities in most workplaces creating hygiene, storage and other health and safety issues. Bike theft is a major problem. Adding facilities can be cumbersome and expensive; leasing additional building/office space, architect and surveyor fees, the fit out, and the associated dilapidation costs, are all significant. We set out to address these issues, whilst keeping the solution as simple as possible. The result is a designed for purpose facility that provides active commuters with exactly what they want and need. Secure and covered bike storage, showers and changing rooms. Our deployment strategy enables facilities to be situated on almost any site. The Active Commuting pods are standalone anti vandal units, architect designed for the purpose of building hubs for cycle and run commuters. 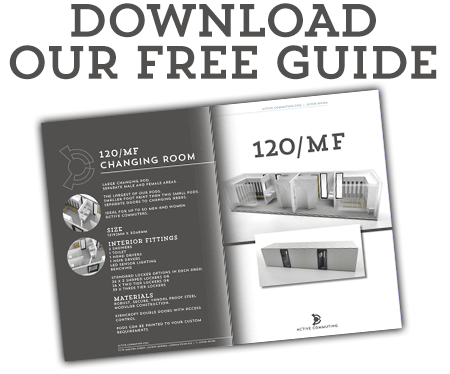 All our hubs can be fitted with access control and the changing rooms can come with electronic lockers. Easily deployed; portable, adaptable and scalable. Think Lego. They can be used in small or large spaces. Where ever there is accessible space. • Visibly promotes sustainable transport, is environmentally friendly, and fits in with most organisations corporate social responsibility strategies. e.g: reduces carbon footprint, improves employees’ wellbeing, general health and effectiveness. • Secure, durable, portable, adaptable and scalable. • Offsite construction; 30% cheaper and at least 50% quicker to construct than bricks and mortar equivalent sized buildings. • The pods can be bought, hired or leased. 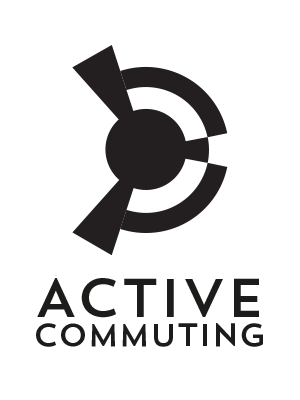 • Online community whose sole purpose is to encourage people to active commute to work. The pods have been designed to be robust and hard wearing, with special attention given to having as few components as possible. Parts are standardised across the product range, making maintenance, repair and replacement of parts efficient and economic. We have a detailed AC Hub business plan for Council and Business improvement districts; outlining operational costs and potential membership revenues. Finally, an excerpt from a letter received from the previous Mayor of London. “Providing facilities for commuters, as Active-Commuting proposes, such as lockers, showers and changing rooms, will play a key role in encouraging people to travel to work by bike. What is particularly appealing about Active-Commuting is that the proposed pods are portable, adaptable and scalable, meaning that they could accommodate different local needs.” 23rd of July 2015.